An innovative training orchestra and master’s degree program at Bard College, The Orchestra Now will play works by Mozart, Weiner, Schumann & Ligeti in a free concert conducted by Zachary Schwartzman. Bold, musical swagger; Mozart was so pleased by the premiere he ate ice cream afterwards! Tranquil countryside erupts into exuberant dance; once banned in Hungary. 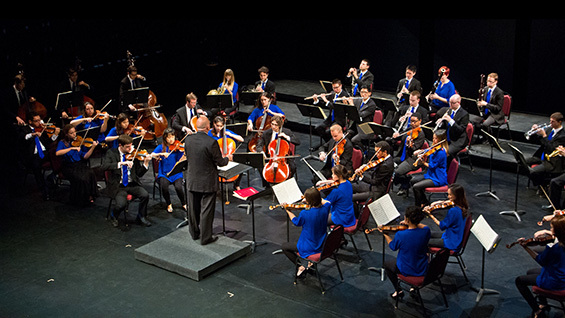 Founded in 2015, The Orchestra Now prepares a new generation of musicians to break down barriers between modern audiences and great orchestral music of the past and present. Under the leadership of conductor, educator, and music historian Leon Botstein, TŌN mines the wealth of underperformed repertoire, reimagines traditional concert formats, and strives to make the experience of the performers a part of the listeners' experience. At a TŌN concert, musicians and audience inspire one other, each following their curiosity with a shared sense of adventure. The musicians of TŌN hail from across the U.S. and six other countries: Hungary, Korea, China, Japan, Canada and Venezuela. In addition to a concert series at their home base—the stunning Frank Gehry-designed Richard B. Fisher Center for the Performing Arts at Bard College—they perform multiple concerts each season at Carnegie Hall and offer free concerts at venues across the boroughs of New York City in the Around Town series. At the Metropolitan Museum of Art they join Leon Botstein in the series Sight & Sound as he explores the places where musical and visual expression meet, pairing orchestral works with masterpieces from the museum’s collection. In addition to Mr. Botstein and TŌN’s Associate Conductor and Academic Director, James Bagwell, guest conductors in the inaugural season include JoAnn Falletta, Marcelo Lehninger, and Gerard Schwarz.